Community members marched Saturday in Los Feliz, where an unarmed man was shot by police because they believed he had a gun hidden under a gray cloth. 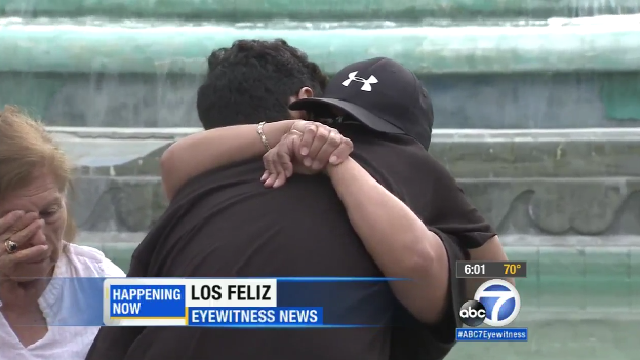 Supporters carrying gray cloths gathered by a fountain at Los Feliz Boulevard and Riverside Drive, hoping to draw attention to the June 19 shooting. “The family is broken right now. They’ve lost their trust to the law enforcement,” said Harry Kazakian, an investigator hired by Deleon’s family. Earlier this month, Walter Deleon walked towards officers with a gray cloth wrapped around his arm in “an aggressive manner,” police officials said. They told him to drop his weapon, but Deleon did not lower his hand. Officer Cairo Palacios then opened fire, critically injuring Deleon. No officers were injured and no gun was found. Neither officer were wearing body cameras during the incident. Deleon, 48, was in critical condition. An investigation was underway. Anyone with information is asked to call Force Investigation Division at (213) 486-5230.